A recipe for Cuban sugar cookies also called Torticas de Moron. These buttery and shortbread-like cookies have a hint of citrus from lime zest plus a dulce de leche topping. In a medium bowl, add the flour, salt, and baking powder. Whisk to combine. Set aside. In the bowl of a stand mixer fitted with the paddle attachment, beat the butter on high speed for 1 minute. Add the sugar and continue to beat for 4 minutes, until it is light and fluffy. Scrape down sides of bowl as needed. Add the egg and beat 1 more minute to combine. Scrape down bowl as needed. Add the rum and vanilla and beat to combine. Add the flour and beat on low speed until just combined. Do not over-mix. Divide the dough in half and shape each half into a round disc. Wrap each one with plastic wrap and refrigerate until firm, at least 2 hours or overnight. Preheat the oven to 350 degrees F. Line 2 large baking sheets with parchment paper or non-stick liners. On a lightly floured surface, roll out a disc to about 3/8-inch thickness. 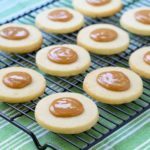 Cut out the cookies with a round 2 1/2-inch cookie cutter. Place the cookies on a baking sheet. Gather up excess dough after cutting the cookies, shape into another disk, and roll out for more cookies. Use your thumb, small teaspoon, or the end of a pestle to make a small indention in the center of each cookie. Place the baking sheet in the refrigerator and chill for 10 to 20 minutes to firm up the dough. Repeat rolling and cutting process with second dough disc. Bake the cookies until the edges are lightly golden, 15 to 18 minutes. Transfer cookies to a cooling rack and cool completely. Top each cookie with a dollop of dulce de leche. Store cookies in a sealed container at room temperature.